The term Generation X, made famous by author Douglas Coupland in his book of the same name, defined an entire generation in the mid-1990s. A shorthand label that acquired pop culture ubiquity, “Gen-X” applied to, in Coupland’s words, that twenty-something “category of people who wanted to hop off the merry-go-round of status, money, and social climbing that so often frames modern existence.” Often referred to by commentators as “slackers” and “the generation without a name,” this core demographic of forty-seven million was ripe for catering to, lampooning, and generally just trying to figure out. The comic book industry was one that attempted to meet this burgeoning market, and in 1994, Marvel Comics began publishing Generation X. With a readymade title of high recognition, that dovetailed neatly with its growing line of X-Men-related comics, Marvel soon found an audience for this groundbreaking book. Generation X reworked a theme established in the earliest days of X-Men, that of mutants being schooled in the use of their abilities. Unlike previous attempts at a school environment for mutants, though, this title had a brazen contemporary perspective. Co-creator Scott Lobdell had honed his writing skills submitting gag material to The Tonight Show, and produced snappy dialogue for convincing teenagers, while initial pencil artist Chris Bachalo combined appealing character designs with dynamic modern storytelling. His was a talent none of the succeeding pencilers could match. Xavier’s School for Gifted Youngsters was based in the Berkshire Mountains of western Massachusetts, removed from the dangers of the X-Men’s Westchester County, New York, headquarters, and the instructors were a decidedly odd couple. The urbane and sexually charged Emma Frost had used her powers of mental manipulation to move within high society, rising to the position of White Queen among the X-Men’s foes the Hellfire Club, where she trained a group of villainous mutant teens, the Hellions. Their deaths caused her to re-evaluate her priorities and initiated her reform. The Irish Sean Cassidy concealed his mutant abilities as an NYPD officer, before briefly being forced to use his powers of flight and a deafening psionic scream in the pursuit of crime. As the Banshee, he is always a reluctant hero, preferring to romance genetic researcher Moira McTaggart, in contrast to his daughter Siryn, who inherited his abilities and grew to lead X-Force. The students were a multicultural group. Asian American orphan Jubilation Lee (Jubilee) accompanied the X-Men and Wolverine before attending the school. Her pyrokinetic powers activated on encountering a mutant-hunting Sentinel, and her sassy and contrary attitude caused tension with Monacan Monet St. Croix, alias M, whose myriad abilities came with a superior social status and attitude. Invulnerable, strong, telepathic, and able to fly, the storyline eventually revealed that the Monet who joined the school was in fact a composite being formed from her two younger sisters, while the real Monet was held captive by their brother, Emplate, Generation X’s first and most persistent foe. He siphoned mutant energy and expelled it in deadly fashion, trapping his sister in a silent form that functioned on instinct, not intellect. 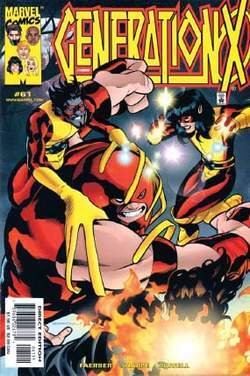 Emplate’s initial encounter with Generation X permitted Monet to escape and join them, subsequently being named Penance. It was some while before writers revealed her true identity, and that the cost of regaining her body was trapping her sisters as Penance. The final female member of Generation X was Paige Guthrie, from a small West Virginia mining community, who calls herself Husk. Her brother Sam Guthrie, Cannonball, had been a founding member of the New Mutants. The ambitious Paige accepted her mutant ability to shed skin to reveal different forms beneath. She became romantically linked with her teammate, the eccentrically spelled Jonothon Starsmore from England. Chamber’s force blasts first manifested with a burst that decimated his lower jaw and throat, an area he covered with a scarf. Able to communicate psionically, he grew from a self-pitying loner, who considered himself a freak, into shortlived status among the X-Men. The African American Everett Thomas, code-named Synch, could channel the abilities of any mutant within his vicinity. The team was rounded out by Latino Angelo Espinosa, known as Skin, who was raised in the barrio of East Los Angeles. As a teenager his skin became gray and pliable, and he was able to stretch it to considerable lengths, although no consideration was ever given to whether or not his muscles and skeleton also stretched, and if not what effects this might have upon him. Resident on the grounds of the Massachusetts academy was Gateway, an enigmatic silent aborigine able to open gates in the sky to other places. Despite ostensibly being there for schooling, the youngsters were rapidly initiated into combat, although their encounters were as often as not prompted by relations between people at the school. While Emplate was their most persistent enemy, Emma Frost’s two sisters proved every bit as manipulative and scheming as she. The younger, Cordelia, attempted to acquire Emma’s former position as White Queen of the Hellfire Club, while the elder, Adrienne, was a deadlier proposition. Able to learn secrets from others merely by “reading” objects they’d handled, she offered necessary financial aid, but her true agenda was to see the school destroyed. Ironically, she succeeded, but not in the fashion she had intended. These weren’t the only antagonists in the series: A human student at the school, Tristan Brawn, had a grandfather possessed of a talisman that surrounded him with an invulnerable force field, and who headed a criminal organization. Banshee’s villainous cousin, Black Tom Cassidy, also appeared several times, and other foes familiar to X-Men readers included Juggernaut and Toad. As the series progressed, there were additions to the cast. Firstly, the far younger Artie and Leech were relocated from X-Factor, under what might be seen as less than the legal requirement for adult supervision. Leech could dampen or siphon away the abilities of any mutant within a certain radius of him. The silent Artie previously lived among a mutant community in the New York sewers, and communicated via sonic “holograms,” essentially projecting pictures. Writers sparingly used the pair, although they took a greater role in the spin-off miniseries Daydreamers. The other-dimensional, millennia-old Gaia was rescued by the team, hung around for a while, and abruptly departed, having spent more time acting thirteen-years-old than honing almost limitless powers. The Samoan Mondo was shuffled offstage permanently when he was murdered by the villain Bastion. A generally cheerful guy who could assume the qualities of anything he touched, he was rarely used during slightly more than a dozen issues with the team. Generation X pushed Marvel’s mutants into new territory by presenting a convincing cast with whom the perceived audience could identify. They were not the clean-cut compliant teenagers who had previously occupied Marvel titles, although they tended toward disobedience and mischief, rather than outright hostility. The blend was enough to make the comic an instant success in 1994, and the Generation X Fox TV movie was fast-tracked, screening in February 1996. While well produced, and generally well received by fans, budgetary restrictions necessitated Chamber, Husk, Penance, and Synch being discarded or replaced by substitutes whose powers weren’t as costly to simulate for television. The plot centered on a “dream machine” created by Emma Frost (played by Finola Hughes) enabling telepathic manipulation. Frost had discarded the device, only for the students to rediscover it years later with troublesome consequences. As the Generation X comic continued, the tone became considerably darker, with the abducttion of children one topic spotlighted. Synch was killed by Adrienne Frost, and Emma subsequently murdered her sister, an act that left vast residual guilt. With Sean Cassidy also self-absorbed, mourning the death of Moira McTaggart, the students decided their education was suffering, and departed the school, at which point their comic was canceled. Cassidy was next seen heading a mutant militia called X-Corps, brought down in very final fashion by some X-Men villains. He’s not been seen since. Emma Frost joined the core X-Men team, as Chamber, as did Husk, briefly. Chamber also starred in a 2002-2003 comics miniseries written by Brian K. Vaughan. Skin was killed by an anti-mutant hate group in 2003. Jubilee was one of the mutants whose superpowers were removed by the Scarlet Witch in the 2005 “Decimation” storyline. M went to work for X-Factor Investigations.